An expanse of beautiful cerulean blue amazonite and synthetic milky aquamarine make up this beautiful asymmetrical necklace by Carley Mak. 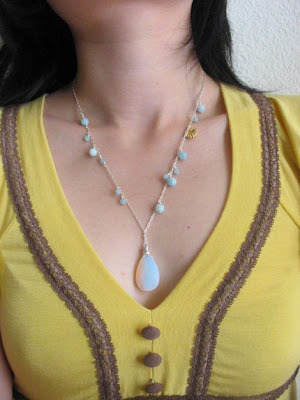 The bold drop pendant and randomly placed amazonite are perfectly offset by the delicate chain and create a beautiful focal at the decolletage. The perfect understated piece for a night on the town with your girlfriends. Because hey, maybe your eyes aren't your best feature.